even if you have never tried to play 9-ball! Play 9-ball Like a Pro!! Set up nine balls inside the rack. Pick out the nine balls numbered 1 through 9, and place them inside the rack. Arrange them in a diamond shape, with the 9-ball in the center and the 1-ball closest to the shooter. Place balls in the rest of the diamond at random. The rack goes in the usual place, with the closest point on top of the foot spot. Have the first player set down the white cue ball anywhere behind the head string. That player hits the cue ball at the 1-ball to break. The break should pocket one ball, and/or send at least three balls to any rail (side). If neither of these happens, set up the rack again and let the next player break instead. Take your turn until you fail to pocket a ball. Whenever you pocket a ball, you get to take another shot. Continue taking shots until you fail to pocket a ball, or you foul. When this happens, play passes to the next player. This includes the break: if the person who broke pocketed a ball, they get to take another shot. Just like 8-ball, you can only hit the cue ball, usually a white ball with no numbers. Know your objective. In 9-ball pool, whoever pockets the 9-ball wins the game. You can even win on the break this way! Of course, there are other rules that makes this goal harder than it sounds. Aim for the lowest-numbered ball. Every time you take a shot, the cue ball must hit the lowest-numbered ball still on the table, before it hits any other balls. If it hits a different ball first, or if it doesn’t hit any balls, the shot is a foul. You can pocket any numbered ball without a penalty. For example, the cue ball can hit the 1-ball, then bounce off and knock the 7-ball into a pocket. This is a legal shot. You can even pocket the 9-ball this way to win the game. Place the ball anywhere if your opponent fouls. If a player commits a foul, the next player picks up the cue ball and places it anywhere on the table before making her shot. As mentioned above, fouls include hitting the wrong ball first, or failing to drive any ball into a pocket or rail. Obey standard pool rules. Standard pool fouls also apply. 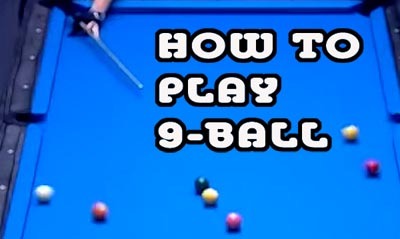 If the 9-ball is knocked off or pocketed during a foul, “spot” it back to the foot spot, or as close behind the foot spot as possible. Other numbered balls that leave the table illegally stay out of play. Here’s a question: If I scratch on the 9 ball, do I lose? Not necessarily. After a scratch or foul, the cue ball can be placed anywhere on the table that the next player desires. If that player then misses, you have a second chance in the game. This is continued until the 9-ball is pocketed. These rules were used at the VNEA International Championships. B. START OF PLAY. The home team breaks first and writes their line-up down first. The break alternates thereafter. A game starts as soon as the cue ball crosses over the headstring on the opening break. D. FOULS. When a player commits a foul, he must relinquish his run at the table and no balls pocketed on the foul shot are spotted, except the nine ball. The incoming player is awarded ball in hand; prior to his first shot he may place the cue ball anywhere on the table. If a player commits several fouls on one shot, they are counted as only one foul. 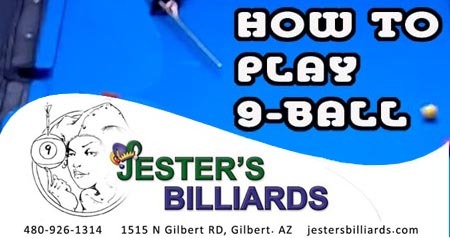 Now, come on down to Jester’s Billiards and play 9-ball! Thanks to the VNEA website for the rules of 9-ball. Click here for more info from the VNEA! For more detailed instructions, with pictures, check out this page at Wikihow! The Rules of 9 Ball Pool (Nine Ball Pool) – EXPLAINED! Note to power users: Notice in the video that the play is on a Diamond table. 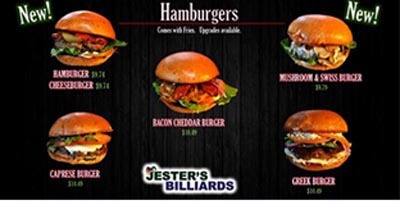 Did you know that Jester’s has Diamond tables? ?